This is such a sweet look. 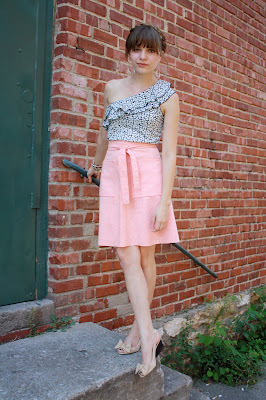 I can't believe no one snapped up that skirt, but it does look great on you! I LOOOOOOVE this look! So cute and the colors are great! I agree with you on the 500 Days. I was completely and totally hot for Gordon-three-names (which I can't recall at the moment) after the movie. P.S. I'm really looking forward to meeting you next weekend! I cannot believe that top is from Old Navy. You're seriously a genius. this is my favorite look you've posted! that skirt is priceless. i wasnt a big fan of 500 Days, but i definitely think the wardrobe was to die for! love this girly outfit, awesome shoes....I hate that the Payless by me never has the designer stuff!! I am so in love with this outfit. love it form head to toe...it looks so girly and sweet. Adorable outfit!! Love the skirt!! That is SUCH an adorable top. Very feminine and girly. I have a thing for everything asymmetrical! I love your hair-do in these photos. And that floral top is to die for. Before I even read about your Zooey inspiration that's who I immediately thought you looked like, so bravo on mastering her look! Btw, any tips on how to get your hair braided up like that? I've tried and failed miserably to get that hair style, even though I hear it's incredibly simple. I put my hair in low pigtails, braid one and use bobby pins to secure it on top of my head. Then I braid the other, overlap it with the first and pin it into place. Try to use the second braid to cover up where you pinned the first. I always use lots of bobby pins, and it usually looks a bit messy. Length definitely helps! Adorable outfit. The color of the skirt is dreamy. + I love Pulp Fiction! I love your outfit. So girly and pretty! and I went to KU. Love Liberty Hall amongst many other places in Lawrence. Just saw this on weardrobe - you look fabulous - love the colour combo! As I said on weardrobe..this is just too darling! !